Nigerian Army University Biu (NAUB) Undergraduates Post-UTME Admission Form, Courses, Admission Requirements, Closing Date / Deadline for 2018/2019 Academic Session. Latest Update: Admission into Nigerian Army University Biu (NAUB) is still ongoing, people should be warned of Fraudsters/Scammers for FAKE ADMISSION, be informed that we do not have any agent for admission processing or payment channel/method apart from the REMITA platform. Report anyone who asked you to pay money for admission through this phone numbers 08181373037/08119719180 or email fraud@naub.edu.ng. 1. 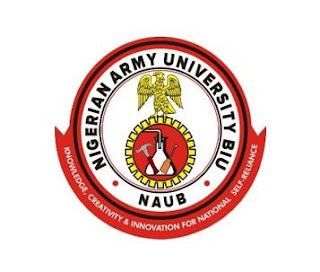 The Nigerian Army University Biu (NAUB) is a public tertiary institution established to engage in imparting knowledge and skills to students using specialized facilities and multi-disciplinary approach; a centre of excellence for various innovative researches and development in military science and technology, logistic management, humanities and other related disciplines. 2. Admissions into Degree programmes are open to the general public. Applications are hereby invited from suitably qualified candidates for admission into the four-year programmes for the 2018/2019 Academic Session. The period of admission into Nigerian Army University Undergraduate Programme has been extended. Candidates can continue to apply to the school through the JAMB Portal until further notice. Candidates are therefore advised to visit the University’s website at www.naub.edu.ng and the Nigerian Army Website at www.army.mil.ng from time to time for important information after application. For further enquiries, please contact us on 07037775329 and 08181373087.